Review: Imagine, three people trying to break into the Queen's tower of treasure. As you may have guessed it wouldn't work out perfectly. Tower of Treasure by Scott Chantler is a graphic novel when Dessa, a tightrope walker, is traveling with the circus and needs to make a big choice. This is the 1st book in the Three Thievesseries. Will they break in and make it to the top of the tower? A girl named Dessa who happens to be traveling with the circus has a few friends who have an idea, but this may give them trouble later on. She is persuaded to break into the queen's Tower of Treasure. She goes with Topper, but is not very happy about it, although she still goes. They get into a little trouble along the way. Draining systems, chains, and all the queen's men may try to stop Dessa and her friends. Do they get away or will they be trapped forever? I did not enjoy Tower of Treasure as much I thought that I might have. There wasn't much suspense, making it way to easy to put down. I might suggest Tower of Treasure to kids that are younger. Nonetheless, I did find the character of Topper to be funny. He is very full of himself and thinks that he is the most important person in the world. I laughed when he had lines like "my head is as good as three heads." The end was kind of annoying because it was sort of a "to be continued" which is frustrating because I want to know what happens. Overall, I rate Tower of Treasure two stars because although there are a few funny moments, I wasn't overly thrilled with Tower of Treasure. We would like to thank Raab Associates, Inc. for providing a copy of Tower of Treasure for this review. 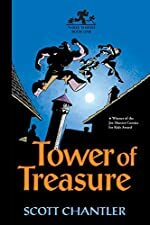 Have you read Tower of Treasure? How would you rate it?